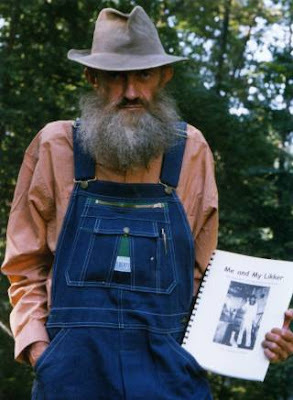 The extremely sad word has just got out in the past few hours that Marvin "Popcorn" Sutton, the world-renowned Appalachian moonshiner, has died in his home. He was due to begin serving a sentence in federal prison this coming Friday, the result of a raid by government agents on his moonshine operation in eastern Tennessee last spring. Following the raid many rallied in support of Popcorn, especially across the Internet. He had also appeared in numerous documentaries about North Carolina mountain culture, and Popcorn was the subject of Neal Hutcheson's recent film The Last One, in which Popcorn brewed (what he claimed at the time anyway) would be his final batch of moonshine. Easily in the eyes of millions, Popcorn Sutton was the living embodiment of a proud but vanishing way of unique American life. Don't quite know what else to say. I am overwhelmingly shocked and grieved by this news, even though I never got the chance I had long desired to meet him in person. It was suicide and its the governments's fault. Popcorn didn't want to wither away in a cold lonely cell so he picked his own time and way of leaving. He did nothing wrong but the officials wanted to make an example of him. His blood is on the hands of the arresting agents the prosecutors and the judges. Popcorn told the judge that he wanted to die at home and not in prison. He lived on his own terms not those of government. A piece of mountain history is gone. RIP Popcorn. Apparently, earlier yesterday Popcorn was served with a paper directing him to report to federal prison this coming Friday. He then sent his wife out on some errands. When she got back home sometime after 3 in the afternoon she found Popcorn in his Ford, which was parked and running behind the house. It looks like he died of carbon monoxide inhalation. A quick look around the blogosphere this morning will demonstrate that his passing is being grieved by a lot of people.